Walter Elias Disney’s corporate vision since it was codified back in 1957. Only two years after the company’s first theme park opened, Walt detailed an expansive vision for Disney – one where every segment of the business worked in concert. With inflation surprisingly low, the Federal Reserve still raised interest rate this week. It has been almost a decade since the last rate hike. They must be confident that the U.S. economy is stronger than it looks. While on the topic of inflation, below are two graphs of interest. Below is a chart of U.S. inflation since 1775. You will notice that we haven’t suffered a period of deflation since the Federal Reserve was created in 1913. The violent drop and rise in inflation and deflation is also gone. 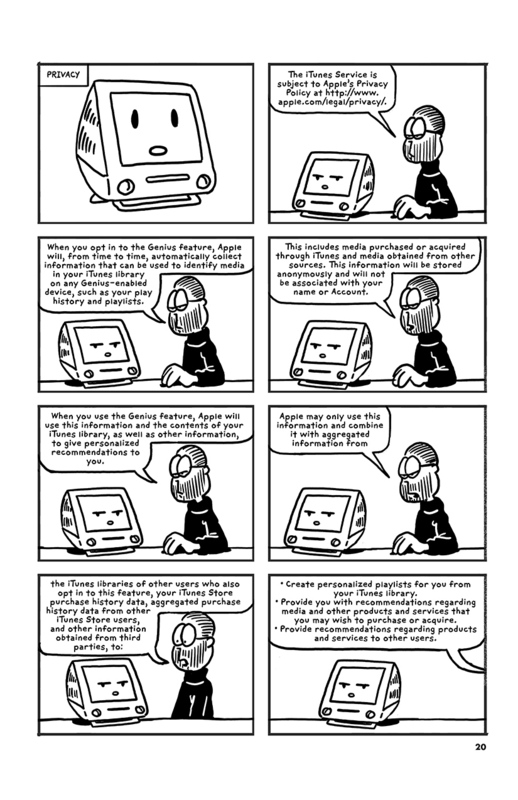 iTunes Terms and Conditions In Graphics! Apple has a reputation for putting a lot of thoughts in their products to make it the best and as consumer friendly as possible. Everything from the original iMac that came out in 1998. That was the cute transparent computer with a colored handle that took the industry and consumers by storm. This probably doesn’t mean a lot today to the readers, but it was a big deal by then. It just needed one wire to operate (just plug it in) as opposed to the PC that required tons of wires to run. One for the mouse, one for the keyboard, speakers, power etc…Then Apple came out the iPod, iTunes, iPhone, iPad and other innovative products. All Apple products are very well regarded by their users. However, there’s one thing that Apple does that really annoys their consumers and it’s that frustrating iTunes terms and conditions update that you need to agree to every other week. Once in a while Apple randomly hits you with a nice 40 something pages legal document for you to “read” and agree to (you have the option to have it emailed to you…) I’m not sure what happens if you disagree/decline their terms. I never did because I’m afraid I wouldn’t be able to use my iPad. It’s written by an army of lawyers and it’s really unreadable. Actually that’s a lie because I never read it, so maybe it’s not boring. Am I suppose to send this to my lawyer for him to read? The whole thing is so ridiculous that South Park even made an episode out of it. Anyway, looks like I’m not alone with that feeling and some people took matters in their own hands. 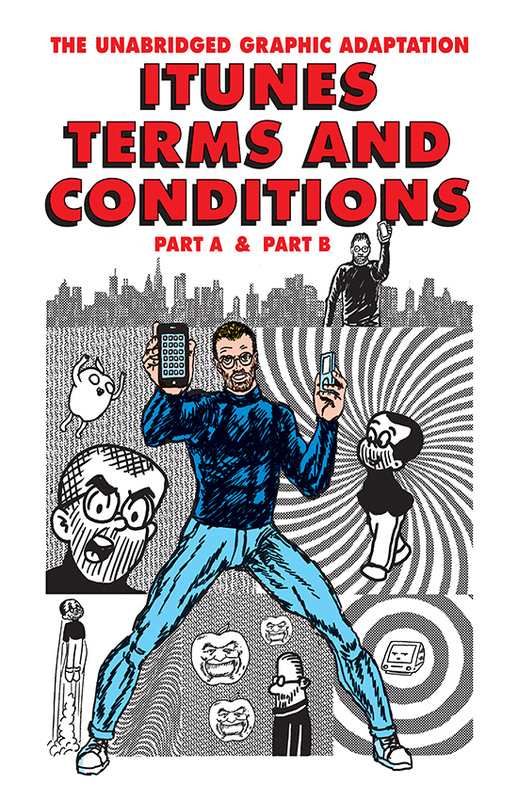 Cartoonist R. Sikoryak published a page by page graphic novel of the terms and conditions featuring Steve Jobs. Definitely not a small task. 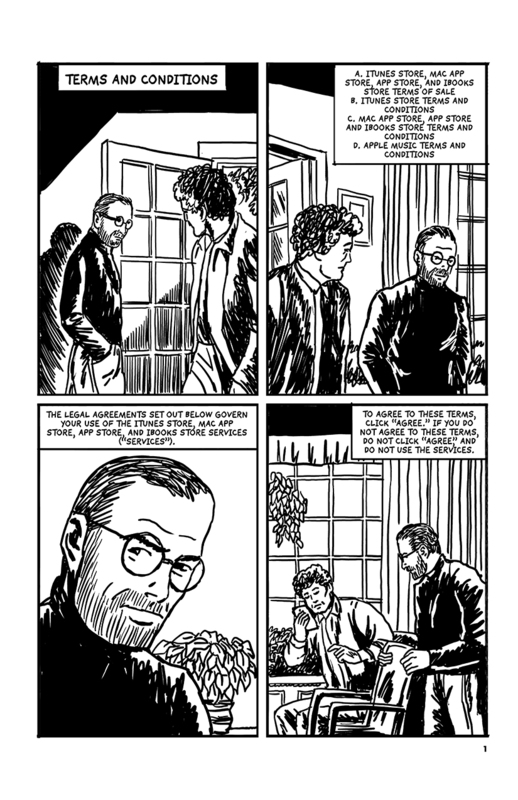 It seems that each page is dedicated to a real comic artist, which some of them you will recognize from your youth. 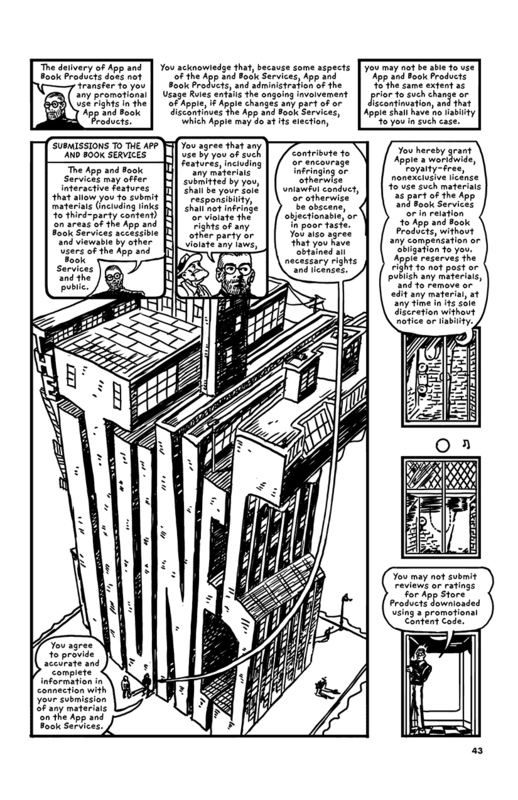 I really recommend that you go check it out at this tumblr page, iTunes Terms and Conditions: The Graphic Novel. Low oil price is the one financial headline that doesn’t go away. Some weeks the news focus on Greece, or China, or the U.S. budget but oil is always there. Other days we hear about the Federal Reserve and interest rates but oil is also right there. You can’t go a do without hearing about oil. Below is an interesting graph provided by the International Energy Agency. It breaks down the average cost of production for the different oil producing countries. Saudi Arabia has the lowest cost per barrel at around ~$20 and the Canadian oil sands is the most expensive to extract at over $70 a barrel. None of this is breaking news. I just like to see in way where it’s comparable among regions. Below are two tables. 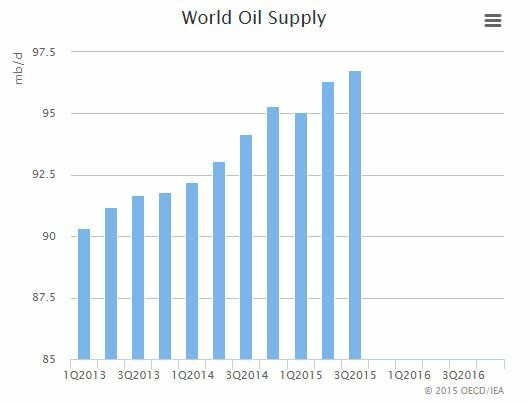 One on of the rising demand for oil displayed quarterly and the second one is world supply. You can see that the demand for oil has increased significantly with the drop in oil prices. 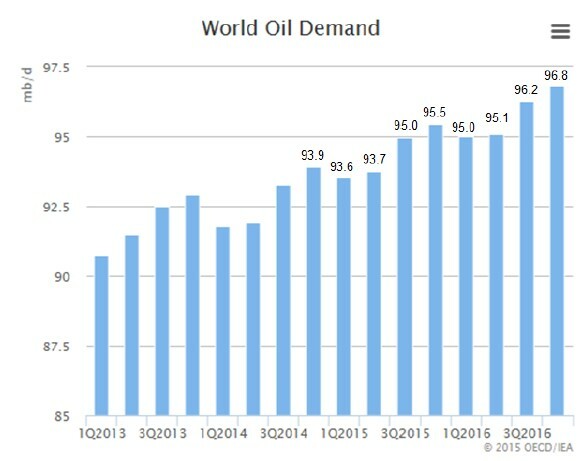 Demand is also expected to hit 96.8m/bpd by Q4-2016. Now supply has to keep up. Because of low oil prices capital expenditure has been slashed the most in twenty years and is still expected to drop in 2016. That could cause an eventual supply shortage or a “rebalance” from excess oil to not enough oil to meet demand in the future. Oil is a depleting resource so if we don’t actively drill for new sources supplies will decrease. And the current production from oil wells is always declining due to natural depletion. That means a well produce less oil year after year and you need to keep spending money to find oil. So there’s a lot of production/supply constrain. First you need a lot of money, then you need to find oil, then you need to drill, maybe you find some, maybe you won’t, if you need do you need to extract it and find a way to ship it out and refine it. There are other intermediaries between the well and your gas tank. Plus you need to navigate the fragile regulatory and political environment that can change at any time. It seems that the cure for low oil prices is low prices. According to the IEA, demand is expected to exceed supply in Q3-2016. If the market is under supplied and demand is increasing, well we have a situation where oil prices have one way to go. My point is you can’t get too comfortable with low oil prices. We hear so much about low oil prices that we feel like it’s the “new normal”, that its there to stay forever. Remember that not too long ago the consensus was the high oil prices weren’t high enough. Oil prices can turn around and shoot up like a rocket just like it came crashing down like a house of card. For more info on oil you can read the IEA Oil Market Report. It’s a great resource on a resource.